Life is busy. That is one constant in my life that I don’t see shifting anytime soon. Even without kids, it often feels like my head is spinning all day long just trying to get everything done. So despite loving to cook, we more often than not scramble to get dinner on the table and during a busy week it can feel like more like a chore than a pleasure. Some nights a bowl of cereal looks mighty appealing when weighing the effort, time and thought that has to go into making anything else. But we often find on those unmotivated nights that when we push ourselves to think of/create easy dishes that don’t require a ton of time or clean up, we feel so much happier in the end that we resisted pulling out the cereal boxes (or our even-worse habit of just going out to eat instead). Last week we had just that kind of night. Leaving work after a long and brain-draining day (followed by an even more draining yoga class), the last thing I wanted to do was stop at the grocery store and wrack my brain for what to make for dinner. But somehow I pushed myself to go. I was in one of those no-mood-in-particular moods (read: totally indecisive) and when I called Neil to try to force him to tell me what to buy, I found him to be in exactly the same state. There was talk of buying frozen pizza (yes, we have been known to go for that kind of lazy convenience – we are human, after all) or defaulting to our usual go-to eggs for dinner, but when I walked by the fish counter I was reminded how easy it is to quickly cook up fish and seafood, and I finally got a spark of inspiration. I bought four scallops and a few pieces of calamari. I remembered that I had a beautifully sweet pink pomelo waiting for me at home (a bit of an obsession this time of year – they smell amazing and taste even better!) which sparked the idea of throwing together a really easy salad. I grabbed some fresh spinach – earthy spinach, sweet pomelo, meaty seafood, tangy dressing – the only thing missing, in my mind, was something pickle-y. So after grabbing a few pickled hot peppers from the antipasti bar (they were hot yet sweet) I raced to the checkout and then home. Neil was skeptical about how this meal was going to come together (fish? fruit? pickled peppers?). But once we threw it all together – Neil in charge of searing the fish, me in charge of prepping everything else – and sat down to the first bite, we were immediately happy that we saved the cereal for breakfast and opted for this quick, beautiful, fresh and balanced home-cooked meal. Neil brushed the scallops and calamari with a bit of olive oil and seasoned the scallops with salt, pepper and some fennel pollen. 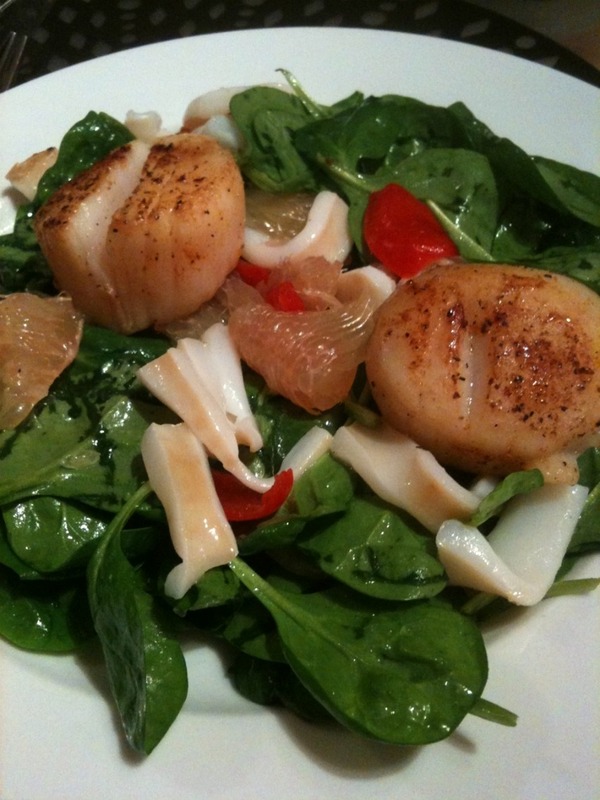 You can use any combo of spices to season up your scallops. He heated a cast iron pan until it was pretty hot and then seared the scallops for about 2-3 min per side, then removed them and cooked the calamari in the same pan until it was cooked but not overdone (a couple minutes per side should do it). I then made a quick dressing mixing the olive oil, garlic and lime juice until really well-incorporated. I chopped up the pickled peppers into small pieces and added them to the spinach. I tossed the spinach and peppers with the dressing, plated big portions onto two plates, and added the pomelo on top. Neil cut the calamari into small bite-sized pieces and placed a handful onto each plate along with 2 scallops each. We sat, we ate, we drank wine, we talked and enjoyed each other’s company at the end of a long day. And after we reveled in how well the flavors of this cobbled-together salad came together in the end, we thanked each other for not giving into the cereal/frozen pizza trap and opting for something unique and fresh instead.